Hello everyone and welcome to the web site for Gozer Games. Gozer Games was founded with the belief that games should be funny as well as fun. We have some great games for you to enjoy, as well as some other products. Please explore, and buy our games. You won’t be disappointed. Please check the news for updates. Last modified on 2012-02-09 07:36:36 GMT. 0 comments. Top. Have you seen these great game reviews we recently received? It’s humorous and easy to play… I could certainly see this game travelling with us to the bar, or being used as a filler game. It’s silly, and sometimes silly is exactly what you are looking for. Next up is Father Geek. He reviewed both Zombie Ninja Pirates and Vampire Werewolf Fairies. Both were a “big hit”, scoring 3.7 out of 5. Zombie Ninja Pirates is a fun little game which is most certainly in the “beer and pretzels” category or, for our little geeks, “apple juice and graham crackers”. [T]he game does exceedingly well. Fast to teach, fast to set up, and fast to play. The variable ways to get points and how your Type cards influence your overall ability to get points keeps the game interesting and the very creative way of keeping track of points during the game make it easy to scan the table to determine every player’s current standing if the game should end. The end result is a fun and fast game full of geek humor that is not meant to be taken seriously, but can be seriously played. For this reason, I’ll be most pleased to bring it to my game table during my next game night. Check out the review of Zombie Ninja Pirates. Check out the review of Vampire Werewolf Fairies. Last modified on 2011-12-16 08:42:54 GMT. 0 comments. Top. 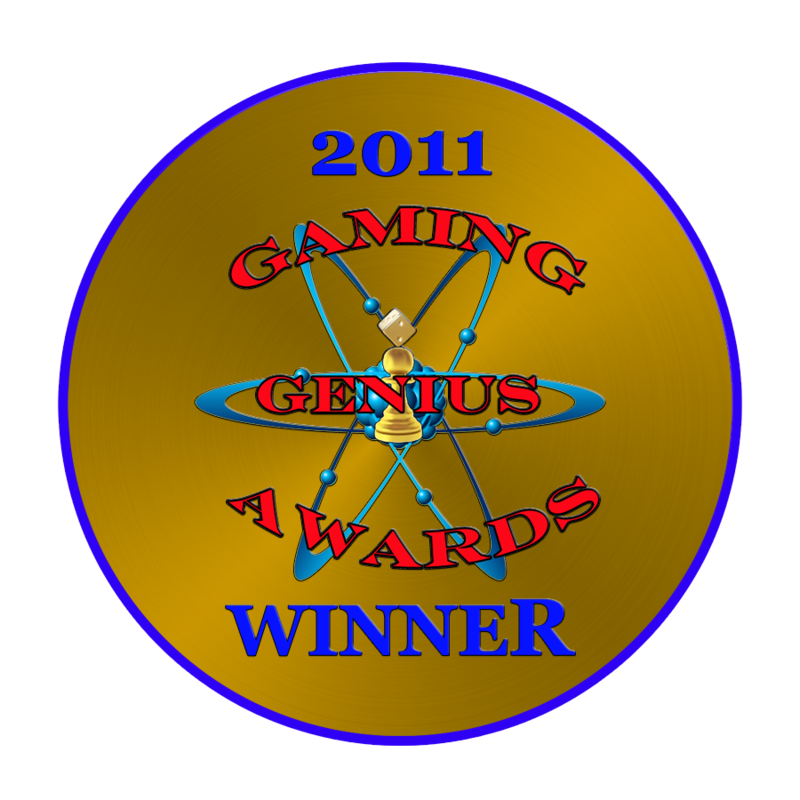 We have been notified that Gozer Games’ newest game, Vampire Werewolf Fairies, has won the 2011 Gaming Genius Award (the “Golden Pawn” award) for Best Non-Collectible Card Game. We couldn’t be happier to receive such a prestigious award! The Gaming Genius Awards were started in 2011 “to recognize genius and creativity in every aspect of the hobby game industry, in a way that reflects expert opinion and not market consensus.” “The Gaming Genius Awards, although new, are intended to be in line with how awards outside the hobby game industry are given out and thus, representing the industry as a whole.” It is a great honor to receive this award, and Gozer Games is thrilled to be the first recipient of the Golden Pawn for Best Non-Collectible Card Game. Vampire Werewolf Fairies and the original Zombie Ninja Pirates are both available for purchase in our store. The Toy Man awards Zombie Ninja Pirates! Last modified on 2010-09-02 21:42:45 GMT. 0 comments. Top. The Toy Man, an independent product evaluation firm, has just posted their Product Evaluation of Zombie Ninja Pirates. It was awarded the Seal of Approval, the Award of Excellence, and the eChoice Award! We are very pleased to be given such great honors. Their evaluators really loved the game. According to many of our evaluation participants, Gozer Games, the creators of Zombie Ninja Pirates, they really blew the doors out with this game. With Zombie Ninja Pirates they have proven that they are truly the mouse that roared! Who would ever imagine that a game with this large of a level of funQuotient™ could come from such a seemingly simple and average game. They also found it highly replayable. During the game Play, there was plenty of laughter and comments about the various artwork on the game cards. The consumers were fascinated with the game. With the game being fast-paced and concluding promptly, this enabled us to have a larger number of consumers being able to play the game. It also caused a substantial increase in the number of consumers returning to the game in the hopes for more game Play. In conclusion of the spontaneous consumer hands-on evaluation of the products they examined, we sat down and went through the video-tapes and consumer feedback forms to establish where”Zombie Ninja Pirates ” stood with the consumers. It was clearly evident that “Zombie Ninja Pirates ” pulled a substantial draw of consumers for repeated Play. It demonstrated that it hosted an excellent creative agenda as well as coming in quite strong in contribution to skill development and response level. “Zombie Ninja Pirates ” passed this segment of our evaluation with the highest level of accomplishment. Gozer Games is very pleased to have been awarded such high ratings!